Education Secretary Michael Gove has been forced to apologise to the prime minister after a bitter public row with Home Secretary Theresa May. 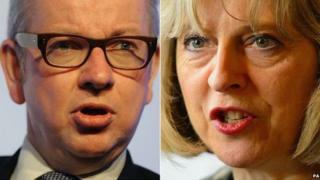 The two cabinet ministers clashed over allegations of a hard line Muslim plot in some Birmingham schools. David Cameron was said to be furious as a briefing war between the two sides erupted in the media, overshadowing this week's Queens Speech. Theresa May's special adviser has stood down over her part in the row. Fiona Cunningham was found by a Downing Street inquiry to have been the source of a negative briefing against Mr Gove. Downing Street announced the disciplinary action after Mr Cameron received the findings of an investigation into the row by Cabinet Secretary Sir Jeremy Heywood. The briefing war began when sources close to Mr Gove spoke to the The Times over the alleged Birmingham schools plot, accusing the home office of failing to "drain the swamp" of extremism. The "anonymous source" also criticised Mrs May's counter-terrorism adviser, Charles Farr. In response, the Home Office released a letter she had written to Mr Gove, accusing his department of failing to act when concerns about the Birmingham schools were brought to its attention in 2010. Shadow home secretary Yvette Cooper said Mrs May could have breached the Ministerial Code by publishing the letter to another minister - something that would normally have remained confidential - on the Home Office website. It has now been removed. Ms Cooper called on Mr Cameron to take action against the home secretary. She also accused the government of being "too busy fighting each other" to properly address the issue of extremism. Speaking on the Andrew Marr show, Ms Cooper said: "We've so far heard nothing from the home secretary, even though it looks pretty clear that she has breached the ministerial code by writing and then authorising the publication of this letter." She added: "I think Theresa May needs to come out publicly and answer what she did to publish this letter." Foreign Secretary William Hague said Mr Cameron had taken firm action "to make sure there is team discipline", stressing that there was no need for further action. The prime minister's response had been a "product of the cabinet secretary's investigation, based on the facts," he added. Mr Gove will be quizzed by MPs over the alleged "Trojan Horse" plot on Monday. Education watchdog Ofsted is inspecting 21 schools in Birmingham as a result of the allegations of a plot. These reports are due to be published on Monday. Two of the government's most senior Conservative ministers are wounded. The home secretary has lost a close and trusted adviser in Fiona Cunningham; the education secretary will face the humiliation tomorrow of appearing before MPs in the Commons after publicly apologising not just to the prime minister, but also to a senior Home Office civil servant he'd criticised. The row between Michael Gove and Theresa May, which had burst into the open in The Times on the morning of the Queen's Speech, angered the prime minister. He will hope his swift response will draw a line under this damaging outbreak of indiscipline at the top of the government. Mr Gove has also apologised to Home Office counter-terror chief Charles Farr after comments critical of him appeared in the Times attributed to a Department for Education source. The claims were detailed in a so-called "Trojan Horse" letter, which was made public in March. It has not been authenticated and some believe it to have been a hoax. The anonymous letter alleged there was a group of conservative Muslims attempting to usurp school governing bodies. It has led to investigations by Ofsted, Birmingham City Council, the Department for Education and the Education Funding Agency. The shadow schools minister, Kevin Brennan, said Mr Gove and Mrs May had both breached the Ministerial Code as a result of the briefings to the Times. He told the BBC: "Really, neither of them should remain in post". According to the Ministerial Code, ministers "should be able to express their views frankly in the expectation that they can argue freely in private while maintaining a united front when decisions have been reached". It adds: "This in turn requires that the privacy of opinions expressed in cabinet and ministerial committees, including in correspondence, should be maintained."